The well-rehearsed scene was executed with quiet efficiency in Los Angeles' Koreatown, played out at about 100 7-Eleven stores in 17 states, including California, Florida, Illinois, Maryland, New Jersey, New York, Pennsylvania and Texas, and the District of Columbia. Officials say the rolling operation is the largest immigration action against an employer under Donald Trump's presidency. In Nothern California, the stores are located in Santa Clara, Santa Rosa, Napa, North Sebastopol, Petaluma and Suisun City. 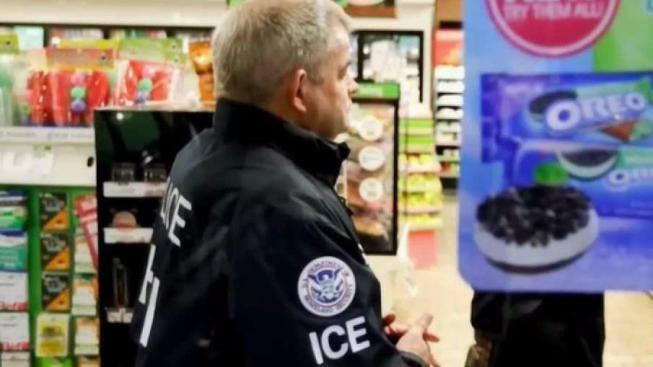 In the South Bay, four ICE agents marched into a 7-Eleven on Los Padres Boulevard just after 6 a.m. They asked the store clerk to show his ID and gave a notice of inspection to the franchise owner. The interaction lasted only a few minutes. The store owner, who said he is scared and frustrated, is scrambling to provide forms that go back three years to prove that his employees are eligible work in the U.S.
A similar scene played out at a 7-Eleve on Washington Street. Some Bay Area residents support the enforcement action. "I don't like seeing it, but I think it's necessary," Ernie Martinez said. However, leaders of the Services, Immigrant Rights, and Education Network, which provides immigrant rights services, worry that Wednesday's move will strike fear in the immigrant community. Priya Murthy described feeling "disheartened and disappointed" because the ICE raids are "making immigrants feel like they can't go places they are allowed to go." The so-called employment audits and interviews with store workers could lead to criminal charges or fines. And they appeared to open a new front in Trump's expansion of immigration enforcement, which has already brought a 40 percent increase in deportation arrests and pledges to spend billions of dollars on a border wall with Mexico. "It's not going to be limited to large companies or any particular industry, big, medium and small," Benner said. 7-Eleven Stores Inc., based in Irving, Texas, with more than 8,600 stores in the U.S., released a statement hours after Wednesday's raid. It said in part: "7-Eleven Franchisees are independent business owners and are solely responsible for their employees including deciding who to hire and verifying their eligibility to work in the United States. This means that all store associates in a franchised store are employees of the Franchisee and not 7-Eleven, Inc."
Franchise business owners are required to obey federal, state and local employment laws, the statement continued, and that includes verifying "work eligibility in the US for all of their prospective employees prior to hiring." "7-Eleven takes compliance with immigration laws seriously and has terminated the franchise agreements of franchisees convicted of violating these laws," according to the statement. Julie Myers Wood, former head of ICE during the Bush administration, said Wednesday's action showed that immigration officials were focusing their enforcement efforts on a repeat violator. Part of the problem, Wood said, is the lack of "a consistent signal" between administrations that the U.S. government will prosecute employers who hire immigrants without legal status. Some immigration hardliners have been pressing Trump to move against employers. Mark Krikorian, director of the Center for Immigration Studies, said Wednesday events offered "a good sign" that the administration was serious about going after employers. But, he said, the administration would need to go beyond audits. "It's important for Trump to show that they're not just arresting the hapless schmo from Honduras but also but also the politically powerful American employer," he said. Wednesday's operations were low-key compared to the Bush administration's stings. In Koreatown, agents gathered in a grocery store parking lot and drove through side streets in unmarked cars to their target location.